Imagine opening a Christmas present only to find the very puck that was the first one to beat you during your junior hockey career. Now, imagine it was from the player who lit the lamp. And, for good measure, imagine it happened to be your own brother. Jonathan Bernier still remembers it all. It was September 24, 2004, a Quebec Major Junior Hockey League (QMJHL) game featuring the Lewiston Maineiacs, with Jonathan Bernier in net, and the Halifax Mooseheads, featuring older brother Marc-André Bernier on right wing. The game happened to be the QMJHL debut for Jonathan, who was given the call when future NHLer Jaroslav Halak, the team’s starter, had trouble with visa issues allowing him to enter Canada. After an initial stop on a partial breakaway, the rebound was fired past him courtesy of Marc-André . “He didn’t rub it in then, but I saw him scoop the puck up after he scored,” recalled Jonathan, who went 7-12-3 with Lewiston in his rookie season. He’d see it again soon enough. The man behind the mask planned to return the favour some day. Three years later, he got his chance. Two good zingers? Absolutely. One big sibling rivalry? Absolutely not. Sometimes, the brothers shared that reputation. Although Jonathan wasn’t the type to sit down and watch an entire NHL game as a kid, he loved to play the game, anytime and anywhere. These days, Jonathan is primed to challenge for the starter’s role in Toronto, a welcome opportunity for the 25-year-old netminder. The bad news is that he will be giving up his first regular season goal as a Maple Leaf in 2013-14. The good news is that it won’t come off the stick of Marc-André, who is the captain of French League team, Diables Rouges de Briancon. 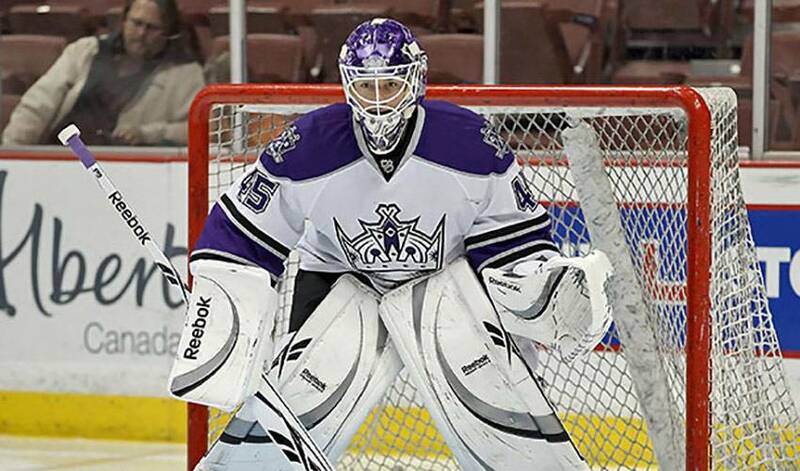 That just might be the best gift Jonathan Bernier gets this year.